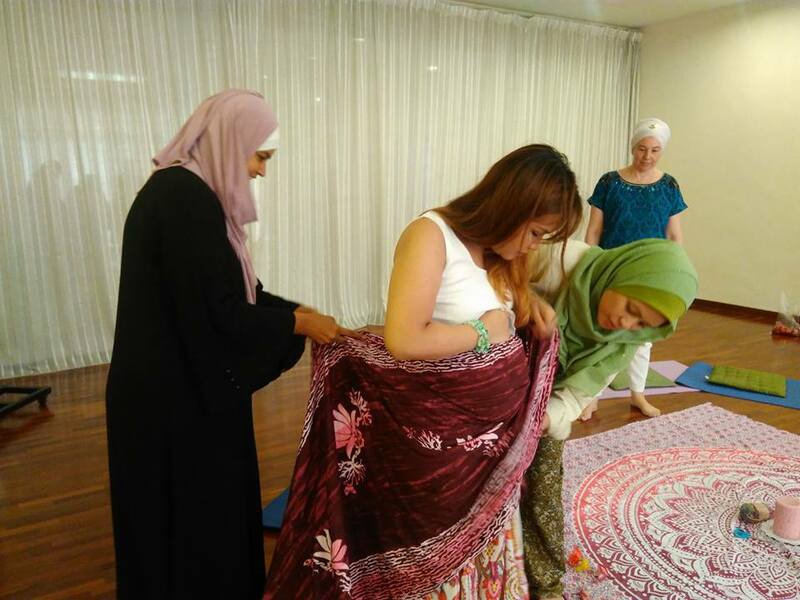 We are concerned that the term “doula” is being misused by certain quarters, and the Malaysian public being made to misunderstand the true function of a birth doula. Doula means a woman servant. It is a modern take of the support a birthing woman would normally receive in a village setting in the olden days – where typically her aunt, sister or neighbor would accompany her while she birthed. Today a doula is a professional birth companion who provides physical, emotional and informational continuous support before, during and shortly after childbirth. Having the presence of a doula during birth has been shown to reduce the incidence of medical intervention such as pitocin and epidural anaelgesia; mothers have shorter labours, fewer cesarean sections and a more satisfying birth experience; and babies tend to have higher Apgar scores (Hodnett et al). In a joint statement on reducing primary cesarean delivery, the American College of Obstetricians & Gynecologists (ACOG) and the Society for Maternal Fetal Medicine declared in 2014, “[O]ne of the most effective tools to improve labor and delivery outcomes is the continuous presence of support personnel, such as a doula.” The latest WHO recommendations on Intrapartum Care for a Positive Childbirth Experience (2018) recommends that all women be accompanied by a companion of choice such as a doula throughout labour and childbirth. A doula does not perform any medical or clinical duties and cannot give medical advice. A doula is not able to make decisions for the birthing mother, but instead provides mothers with information to help her make informed decisions. Therefore doulas do not take the place of a trained medical professional. In Malaysia, there have been certain individuals who attend unassisted births who claim to be doulas. (An unassisted birth or free birth happens when the birthing person chooses not to be assisted by a medical professional such as a qualified midwife or doctor during birth.) This gives a false sense of security to the birthing family, as the doula is unable to recognize and take appropriate action in the case a medical emergency arises. These individuals do not necessarily represent the doula profession. Doulas work hard to maintain a good working relationship with obstetricians and maternity ward staff, as we are cognizant that we are all part of the birthing woman’s birth team, and the smooth working of the team is paramount to a good outcome. A doula does not override the authority of the medical staff, but rather ensures that the birthing woman’s birth preferences are supported within the maternity healthcare system. 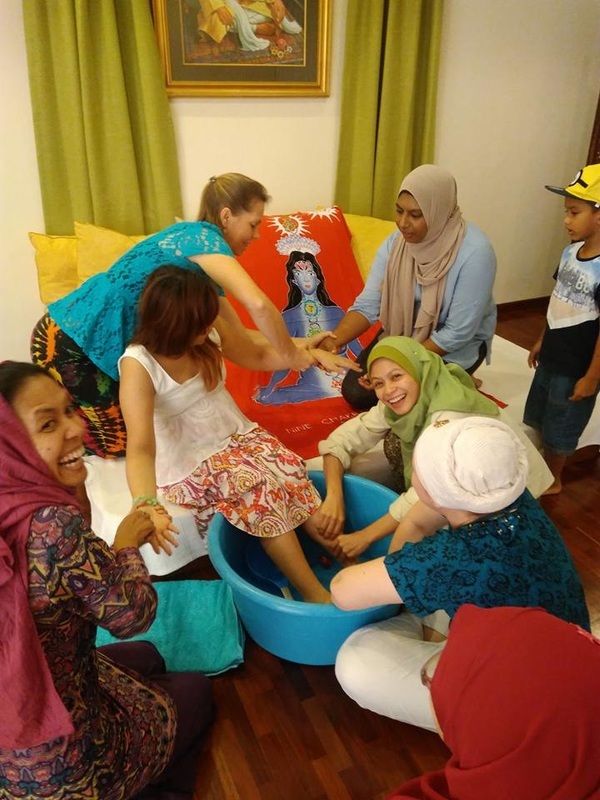 Hospitals such as Pantai Bangsar Kuala Lumpur, Pantai Cheras, Gleneagles KL have all been welcoming and working well with doulas for the past nine years. We look forward to a continued good working relationship with the maternity healthcare system, and hope that the public can come to understand the benefits of having a doula during birth. A blessingway is a beautiful way for the expectant mother's friends and family to welcome the new baby into the world. It is typically held in the third trimester, but it can really be held anytime during the pregnancy. It is meant to be a celebration by the whole community to welcome this new life into their lives and prepare the mother for the birth of the baby and her impending motherhood. Different activities can be done during blessingways. Generally the idea is that the family and friends of the mother celebrate and consciously prepare for the arrival of the child into their lives. The coming of a new baby in the community provides no better opportunity for introspection and a re-evaluation of our hugely important roles as careproviders, nurturers and educators of the future generation. I was privileged enough to be a part of a blessingway for a dear friend, Deep. Deep was one of my first HypnoBirhting students when I started giving classes in 2011. She has been an invaluable contributor to The Gentle Birthing Group, online and offline. She has a boundless energy and enthusiasm when it comes to birth and has truly been an asset to the birth community for the past several years. She holds a special place in my heart and I'm so glad I was able to help her organize her blessingway. She invited people whom she hadn't seen in a long time and invited me to do some hypnosis together with a mutual friend to do some other activities. We started off with big plans to do belly painting, among other things, but in the end we had to keep it flexible because some people arrived late and some had to leave early. It actually worked out well when the event took on a life of its own. We then sat around a circle and each shared how Deep has touched each of our lives. Some of us read her poems. This was definitely an emotional part. Deep has touched alot of us in our individual lives... so there was alot of tears :P It was eye-opening and heart-opening to listen to everyone's tributes and wishes. As some of us hadn't seen each other for years, this sharing also enabled us to reconnect. We could feel our psychological barriers come down and we were able to just be and revel in the warmth and compassionate energies we each exuded. We then each gave a bead/ charm to Deep, which she will use to make a bracelet which she will wear during her birth to remember us by. We each tied a ribbon around a big candle too. We had a hypnosis session that helped us relax and explore our subconscious feelings (well I conducted it, so next time I'll be on the receiving end hopefully!!). We then each wrote inspiring, motivational quotes on a card so that Deep can read them during her birth and gain strength from them. We did gratitude exercises sharing how and why we are grateful for our children and what motherhood has taught each of us. An emotional session - it reminded us, that we are all teachers for each other, but more so we are all learners - and motherhood is one of the greatest of life's lessons. "It takes a village to raise a child" goes the saying. But in this day and age, when urban living, nuclear families, technological devices and increasingly individualistic mindsets has forced us to radically redefine the village, it is ESPECIALLY difficult for mothers to get the support that we so need. A blessingway is a beautiful way to gather the tribe of the motherbaby and prepare for the coming of a child ina meaningful and conscious manner. 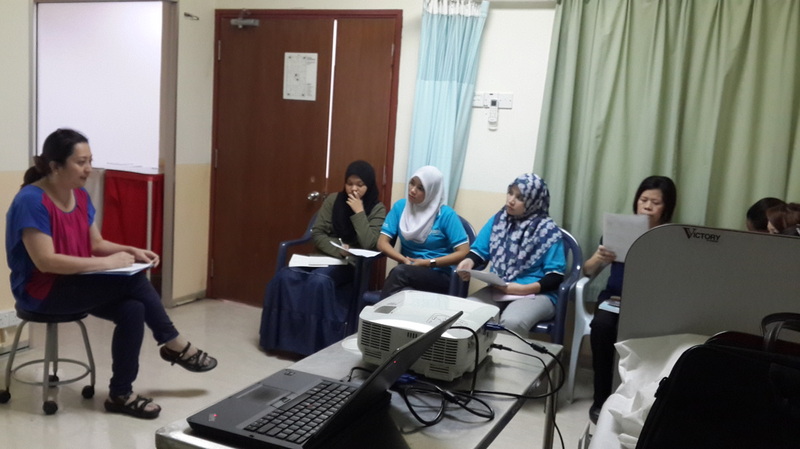 Last week I had the privilege to address new nursing and midwifery staff at Pantai Cheras and give a talk about HypnoBirthing to them. Everytime the hospital hires new staff for their labour and delivery suite, Dr Tan Ee Ping holds briefing/ training sessions to introduce the new staff to HypnoBirthing and waterbirth, and standards of care and protocols. I started the talk by introducing the concept and basic premise of HypnoBirthing and what parents are taught in class. The I went on to talk to them about their roles as careproviders towards mothers wanting a natural birth from my perspective and experience as a Doula and HypnoBirthing Childbirth Educator. Many of them were visibly intrigued to learn about the HypnoBirthing philosophy and principles, and the non-medical aspect of birth. A few were touched when I talked about the power that nurses and midwives assume when caring for a birthing mother. After that, Dr Tan talked on her take on HypnoBirthing as an ObGyn. I must say, it was such a privilege to be present at a talk where an ObGyn teaches her staff about HypnoBirthing and natural birth! It's one thing coming from a non-medical professional, but quite another coming from an ObGyn. At one point, Dr Tan took out her handouts and explained that HypnoBirthing mothers use very different vocabulary and nurses were not allowed to ask the HypnoBirthing mother if she feels pain. That was truly a notable moment! 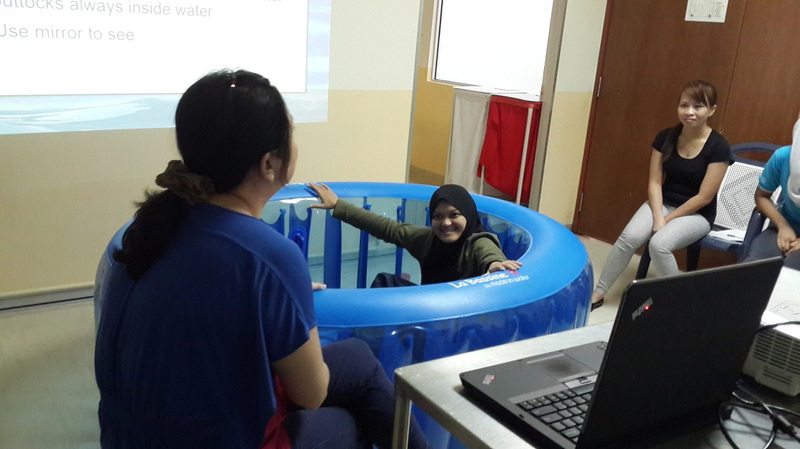 Later Dr Tan talked about waterbirth and covered the standards of care for waterbirthing mothers as well as positions and other protocols. I learnt a thing or two about their standards of care and protocols, and am grateful to have some extra info to share with my mothers. All in all it was a great experience... and I left with a feeling of hopefulness for mothers who will birth in Pantai Cheras in the future. About a year ago I gave a talk at my daughter's pre-school about my job as a Doula. It was so much fun! I was so proud and glad to be able to talk about my job as a Doula to 4 year old kids. How often is it that children get to hear about Doulas and Midwives rather than your traditional run-off-the-mill careers like doctor, engineer, architect, etc? ... especially here in Malaysia where conventional jobs such as lawyers and accountants are bountiful and considered successful.. I explained the basic premise of my job - mom feels powerful sensations when she is birthing and needs as much support, love and understanding during this time... "The uterus is a powerful organ and mama feels powerful sensations when bringing your baby brother or sister into the world... Would you like to help mama feel comfortable during this time? How can we do that?" 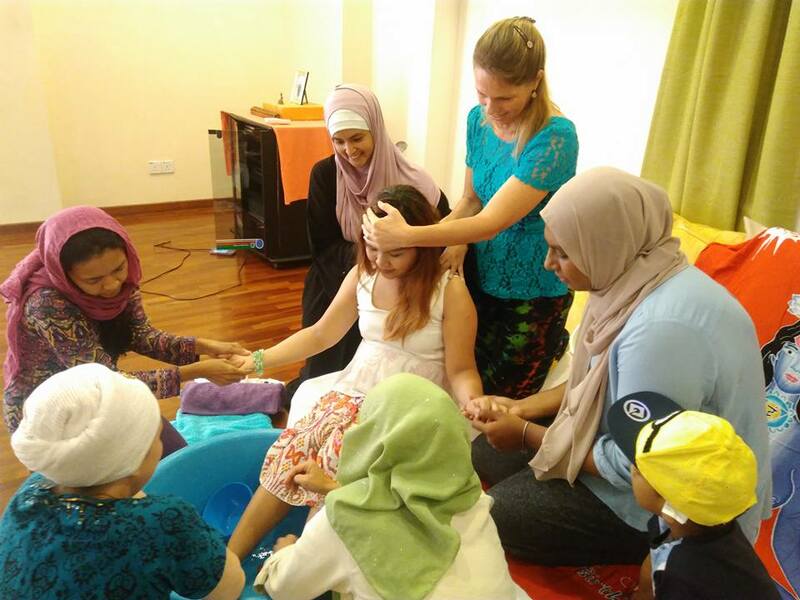 They were all so eager to help the pregnant mama by wiping the sweat off her face, massaging her back, giving her sips of water, etc... One of the little ones massaged the mama's feet and didn't stop until the end of the whole talk! Needless to say the pregnant mama was very pleased :) ALL the children had an instinct to help the pregnant mama... a beautiful reminder to me that we human beings are instinctively loving and compassionate... and we need just to look at our little ones to realize that.. They are all amazing little doulas-in-the-making!! Here's to the future of our society - full of compassionate, kind, loving doulas, childbirth educators & midwives! If you think HypnoBirthing is simply getting the right breathing techniques, or having a completely natural birth, then you are mistaken. The meaning of HypnoBirthing goes much deeper than that. To say that it only advocates one right way to birth, will not do it justice. Yes it is a philosophy about birth over and above anything else - but, more importantly it encourages mothers to take ownership of their births. Did I do my best to provide my baby with the gentlest birth possible considering my circumstances? Did I make the decisions during my birth or was I forced to accept an intervention I was not fully-informed about? Did my careprovider honour my birth preference/ wishes like they said they would? Did I get adequate support during my labour and birth so that I was able to just be and birth undisturbed and unhindered? On the flip side, if you feel like you need to talk over your previous birth with someone, then please do so! I can't stress enough how important it is to de-brief and re-visit your birth with openness and without feeling like you are being judged. Embrace your unique way of birthing and embrace your unique experience - some mothers make loud noises, some mothers are completely silent, some mothers need visual cues, others need music, while others still need complete silence. What is of more importance is that you follow the lead of your own body... and do your monkey! (as a good friend would say).. And YOU play a central role in your birth. For mothers approaching your birthdate, its good to remember to remain flexible. In HypnoBirhting we tell moms to visualize and watch your thoughts, as they create your reality.. but alot of times, the healthcare system in Malaysia makes it close to impossible to have a gentle undisturbed birth..so its not uncommon that hospital policies & procedures get in the way.. So be flexible, but at the same time keep your eye on the goal... and the best advice I ever got as a birthing mother (coming from midwives and ObGyns alike) is : If you're OK, stay at home for as long as possible!! 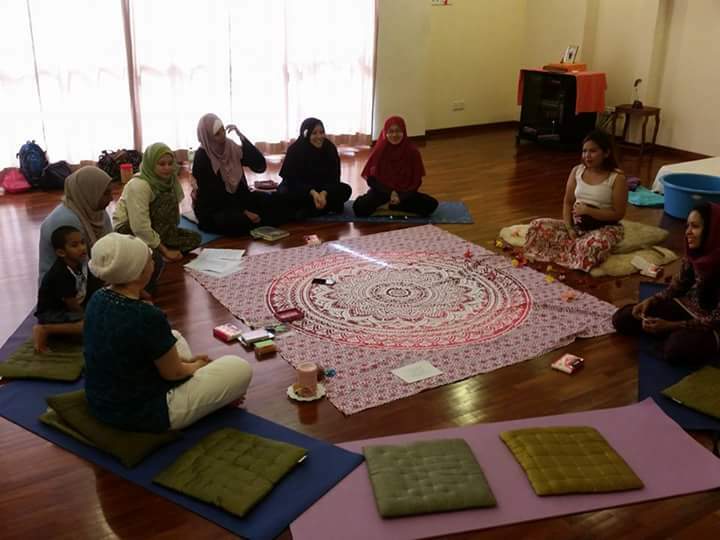 I often get asked what the difference is between Amani & HypnoBirthing classes. They are both independent childbirth classes - meaning they are not affiliated or accredited by any hospital, doctor or medical body. They are accredited by independent bodies. The classes teach parents about physiological birth - i.e. what happens in your bodies on a normal healthy level. They are by no means meant to take the place of medical advice. There is a slight difference in Amani and HypnoBirthing classes. HypnoBirthing has been around for over 20 years and it provides techniques on harnessing the power of the mind to achieve your dream birth. The techniques include self-hypnosis, visualization, affirmations, breathing, relaxation and deepening among others. Most people will find that they carry on to use these techniques during other times in their life. Amani is fairly new - around 4 years and focuses on providing evidence-based information to parents to help them make informed decisions during their birth. It has elements of Qur'an and hadith and the basic premise is trusting that Allah's creations are perfectly designed (backed up by evidence). This in itself is very powerful. HypnoBirthing also provides roughly the same information. Its just that the emphasis is on the techniques and achieving the birth you want. Both classes have the importance of shopping for the right doctor/ careprovider, the importance of a birth preference/ birth plan, your options before, during and after birth, and taking ownership of your birth. The classes fundamentally are really quite similar in that sense - they just have a different emphasis. Do you need to attend both classes to prepare for your pregnancy? The short answer is no. Attending either one will usually be sufficient. Recently I was interviewed on BFM 89.9 in their "Careers Unusual" segment about my job as a Doula. I guess its an unusual job - seeing as there are less than a handful of certified doulas here in Malaysia. I was excited to be on air, because there really is so much misconception about what a Doula actually is among doctors, nurses, hospitals and the general public. Some think we are there to make medical decisions for the mother. This is completely untrue. We are non-medically trained professionals who provide emotional and physical support to the family throughout labour and birth. We actually have quite a tough job - because on the one hand, we are employed by the mother and father, yet on the other hand we are in the hospital premises and in the delivery suite. So its really important to work well with the labour ward staff. The staff - nurses AND doctors - can view us as a threat if they don't understand what our role is. 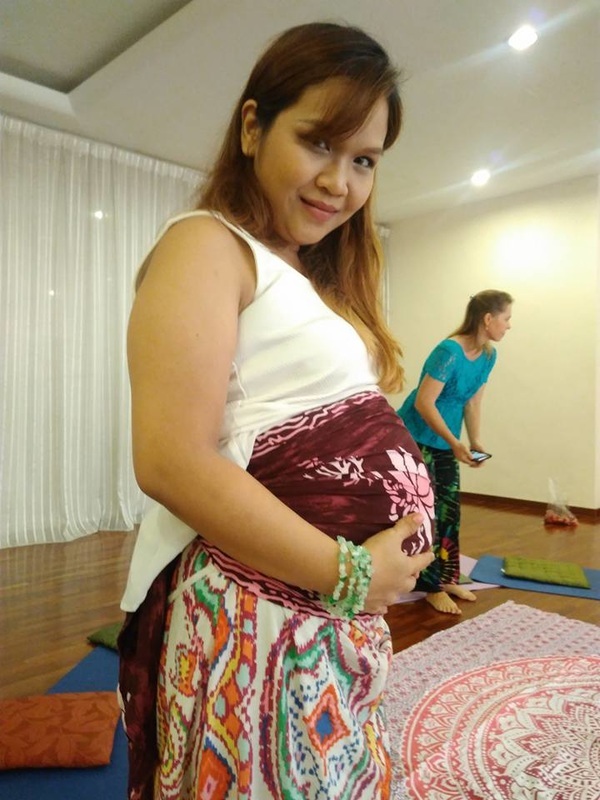 And lately Pantia Bangsar has issued a directive for mothers wanting a doula at her birth to sign a notice of understanding which states the role of a doula at birth is questionable at best and "risky". Although the Ministry of Health has come up with the latest Mother Friendly Guidelines "Program Mesra Ibu" that clearly states mothers should have continuous support throughout labour and birth by a birth companion - be it her husband or a doula. It seems this is merely lip service. Many government hospitals still do not allow even husbands to be present with the birthing mother during labour and birth. Q1. Are doulas governed by a regulatory body? A: We obtain training from the certifying body e.g DONA/ CBE/ AMANI and we are required to re-certify every year. This body is independent. Q2. Do we attend homebirths? Q3. Are doulas employed by the mother or by the hospital? A: We are independent and employed by the family, and therefore have to a duty to protect her space during labour and birth and do what is necessary in the labour room for mother to achieve the birth she wants - such as advocate for her choices. HOWEVER we cannot completely disregard the hospital staff. In fact its very important for us to develop a good working relationship with them. This can sometimes be tricky to know when to advocate for mother and when to be flexible considering the individual circumstances. Q4. Do doulas provide information to the family? A: Yes definitely. We can provide the family with research and evidence-based information to enable the family to make an informed choice. Anyway, have a listen to this podcast. It may shed some light on what the role of a doula is. I’m still reeling with oxytocin from a recent birth. It was a beautiful VBAC waterbirth!! I can't blog about it until I get permission from the mother. So I'm going to talk about my experience instead! haha.. This was my FIRST time doula-ing at Pantai Cheras. The hospital just began to offer waterbirths a couple of months ago. And this was the first time their delivery suite ever had an official doula present at a birth! So I was excited, but wasn't exactly sure what to expect – especially from the staff. I had heard the waterbirth room was small... but really mothers have birthed in small buckets before..lol..so I wasn’t too concerned about that. The mother was doing beautifully all throughout her labour and went to hospital only when it got really intense. So when we arrived at the hospital she was already in her ZONE - quiet, focusing inwards. The environment in the delivery suite was rather busy and noisy - staff talking on the phone and to each other, rushing in and out of rooms. Just outside the waterbirthing room was a desk with a phone, so everytime the phone rang, we could hear it. The door to the room was a glass foldable door and not sound proof, so if it wasn't completely closed, we could hear the sounds of the nurses talking outside. There was a flurry of activity as the mother entered the birthing room and tried to settle in. The pool was about a third way filled, but mom couldn't wait and immediately got in. There were a number of nurses entering and leaving the room trying to fill up the pool and get the water to be the right temperature. To do this they had to drain some cool water out of the pool using a pump and fill it with hot water which they had to get from a thermopot outside of the room (in addition to hot water from a hose attached to the waterheater). So there were staff going in and out of the room frequently. The pool is a LaBassine pool, so it took some time to fill. The nurses were trying to get the CTG machine strapped on to mother’s abdomen and at just the right spot to be able to get a good reading. This was a wireless CTG machine - the FIRST ever being used in Malaysia as far as I know. The nurses tried to get mother to lie back, but she couldn't. The only comfortable position for her was leaning forward onto the side of the pool. At one point, there were three nurses hovering around the mother - one trying to drain water from the pool, and another two adjusting the CTG machine on mother's tummy. Mother shifted uncomfortably and was visibly annoyed. I felt slightly helpless at this point - should I say something? I didn't think it was a good idea to say anything just yet because we had just arrived, and I didn't want to turn the staff off working with doulas ever again. Lol. So instead, I focused my efforts on mother and trying to get her into her zone again with massages and hypnosis. I silently prayed that the fuss would soon settle. After several subtle attempts by me to get the nurses to leave the room and quiet down and close the door, the activity died down and it was quiet at last. Father joined us after some administrative work and the two of us worked to make Mom as comfortable as possible, and protect her space. Every so often the CTG machine would beep and disturb the silence. I was SO grateful for this GREAT tool that enables mother to move around freely in the tub, but at the same time, I was cursing it under my breath!! I knew though that it was important for the staff to get a good 20-minute strip reading especially with a VBAC Mom, so I just had to bite my lip and hoped Mom could endure the hassle just a little bit longer. It took quite awhile to get it at exactly at the right spot, and even then the reading would only last a few minutes before the trace went off again. Mom was left alone for a few more hours, and before long, baby finally made her slippery entrance into the pool and was placed onto Mom’s chest. Tears and words of joy all round! Mom was incredulous! It really was a beautiful birth - the star of the show of course was mother - and I really can't wait for her to write her birth story. But as far as the staff at Pantia Cheras is concerned - they were really great! Two thumbs up for effort – most definitely!! They had never really been exposed to a doula and other requirements of HypnoBirthing mothers apart from taking the lead from Dr Tan (who is a HypnoBirthing Practitioner herself) ..but they had positive attitude about supporting the mother and father, and this speaks volumes. Pantai Cheras had 6 waterbirths prior to this one, but I was glad and relieved that the staff accepted and acknowledged my presence and my role and were willing to cooperate! Of course things could have been much better with staff being more respectful of the mother's needs for privacy, quiet and getting informed consent before carrying out things like taking her temperature or taking her blood pressure, etc., but this can all be learnt in time. Dr Tan really has to be given most credit. She really is one of those rare ObGyns who is willing to stick up for what is right, rather than what the system dictates, and because of this many mothers have been able to enjoy undisturbed births in medicalised settings. I’m excited for mothers who will birth in the future- especially for mothers who will birth in Pantai Cheras. With more training of staff on the needs of HypnoBirthing/ natural birth mothers, I can see much improvement in catering to natural birth mamas.. and who knows, maybe one day Pantai Cheras will be a hub for natural birth mamas to go to. And there are already plans for training in the near future!! BUT of course, as with all other hospital births, the mother herself has to be extremely mentally and emotionally prepared. This mother ROCKED her birth and I'm sure many more mothers will in the future inshaallah, with the growing awareness about natural birth.